Everything that Northern Wisconsin holds dear is gravely threatened by Gogebic Taconite (GTAC) and from out-of-control legislation coming from Madison that is selling our precious natural resources, not to mention our democracy, to the highest bidder. The Penokee Hills would be blasted and excavated into oblivion, becoming the largest open-pit taconite mine in the world, if GTAC is allowed to continue on its present destructive course. First phase: 4.5 miles long, 1 mile wide, and 800-1000 feet deep and over time, a “war zone” nearly twice the length of Manhattan. Where are you in this fight for your water, for Lake Superior, for the health of your children? We hear many people assume that the Bad River Band of the Lake Superior Tribe of Chippewa will block this mine. It is not wise to rely on a single strategy or to place the entire burden on one group of people. As you read this, GTAC is drilling into the Hills to obtain core samples. Their next assault will be “bulk sampling.” Vegetation and soil are removed and after holes are bored in the rock, explosives blow sections into six inch stone and the material is hauled off for testing – many thousands of tons. Already vehicles have left deep ruts in the roads used to access the drill sites and drill sites, one by one, are being cleared. Map of the Bad River Watershed where all the wastewater from the mine would flow. The watershed’s surface and groundwater provides drinking water for the towns of Ashland, Mellen, Highbridge, Marengo, Odanah and Upson. The vast amounts of water required to mine would cause a drawdown of the water table and when the rock is crushed to powder, it will release sulfuric acid, mercury, lead and arsenic into the soil and water. The explosives required for mountain top removal create particles the size of a virus which transmit easily on the wind and are highly carcinogenic. The human system cannot block particles of this size. Miners on the Iron Range have higher rates of the rare mesothelioma, and higher rates of lung cancer and heart disease than the general Minnesota population. Taconite mining is the 2nd largest source of mercury emissions after coal power plants in the Lake Superior basin. Most northern Wisconsin waterways are already under fish advisories for mercury. 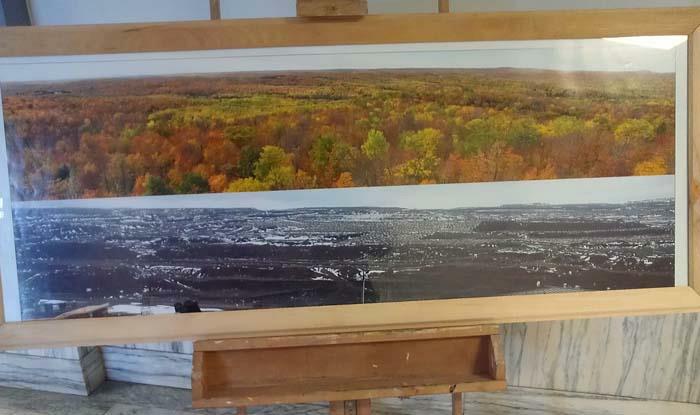 GTAC proposes to offer us a 355 acre, man-made lake, as they turn their backs on the largest freshwater lake in the world, Superior, into which their acid drainage and other contaminants will flow. 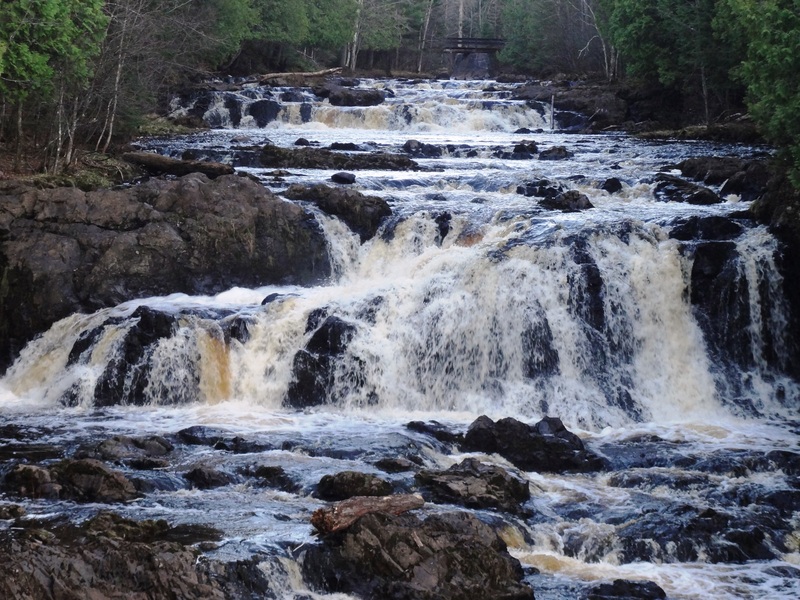 If the Penokee Range, Copper Falls State Park and Bad River Watershed are effectively destroyed, significant tourist, farming, fishing and hunting income will also be lost. Mining does not bring lasting prosperity. Median household income in St. Louis County, with Minnesota’s largest taconite mines, was 22% below the state average between 2007-2011. Cliffs Natural Resources is laying off 625 workers at taconite mines in MI and MN due to falling demand for taconite. Mining creates a devastating boom/bust economic cycle, fostering an array of economic and social problems. Businesses created in mining towns typically include strip bars, pawn shops, massage parlors, and payday loan and bail bond offices. 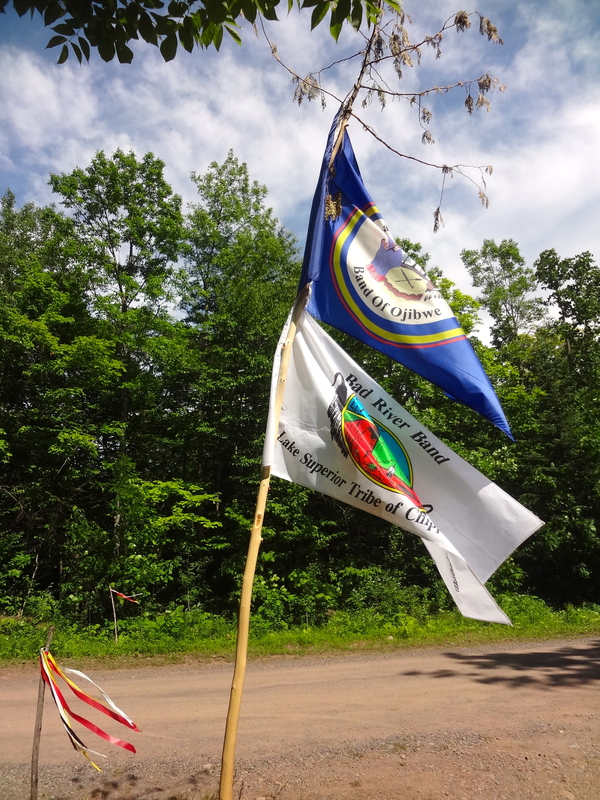 Lac Courte Oreilles and Bad River Bands of Lake Superior Chippewa sovereign flags. The Kakagon and Bad River Sloughs (40% of the wetlands in the Lake Superior basin), at the mouth of the Bad River Watershed have been designated a Wetland of International Importance. They host a diversity of habitat, plants, and animals; are a spawning and nursery area for fish; and provide critical stopover habitat for migratory birds. The Lake Superior Chippewa have harvested wild rice in the sloughs for centuries, and continue to enjoy it as a sacred food. Pyrite and other sulfide minerals, when exposed to water and air from blasting, produce sulfuric acid which would flow into the Bad River and the sloughs. 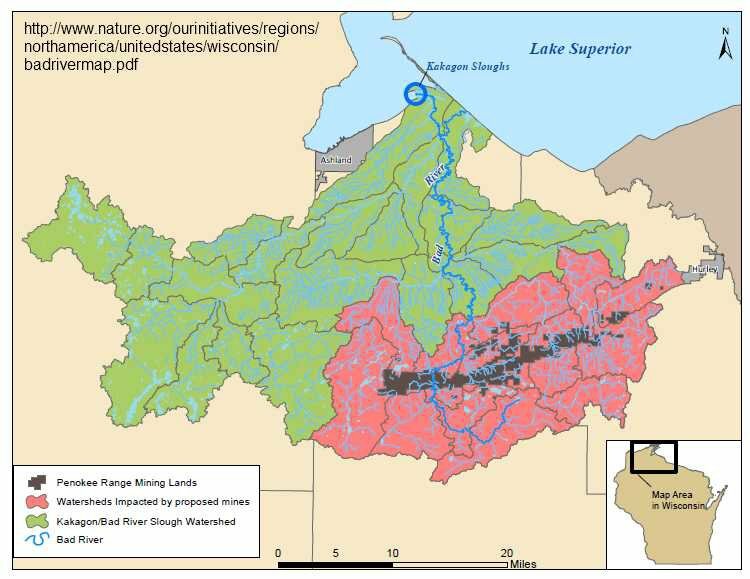 A potential lease between GTAC and Iron County for toxic mine waste storage would affect over 1,000 acres of wetlands, many connected to trout streams. This mine would create an estimated 910 million tons of waste rock, likely producing sulfate pollution greater than that in the St. Louis River in Minnesota, where wild rice shows damage from sulfates up to 100 miles downstream from the Mesabi Iron Range. Safe taconite mining is a myth. No taconite mine has ever operated, anywhere in the world, without producing enduring air and water pollution. Help to protect the Penokee Hills and waters by sending a tax-deductible donation to: Penokee Hills Education Project, P.O. Box 834, Ashland, WI 54806 or to: Defend the Bad River, P.O. Box 39, Odanah, WI 54861. Donate online at: www.badriver-nsn.gov. Other important action steps include reading more about this critical issue at www.penokees.org, attending public meetings and community forums, voicing your concerns to local officials, and discussing the situation with your neighbors. Our pristine environment and life-giving aquatic resources can never be replaced, but could easily be destroyed with disastrous long-term environmental, social, and economic consequences. Is this the legacy we want to leave to the future? Of course just credit Ros and Alie and WCMC. THanks! They thought we were a bunch of ignorant rural hicks that they could bamboozle and expand mining statewide-West Virginia in Wisconsin was their dream. They’ll lose money drilling then being blocked by the courts-hopefully that will learn the lesson and stay the hell away fro now on.